Barbara Crooker is a poet I first met online at the Wompo listserv. We soon met in person when we got together for dinner prior to a reading I was giving in Pennsylvania where Barbara lives. We've met numerous times since then—at poetry retreats, AWP, and conferences. We've also read together and attended each other's readings. It is my pleasure to now host a poetry salon for Barbara's third book, More, recently published by C&R Press. Barbara will now talk to us about her book. Diane: You have two previous collections. Is this new one a continuation of or a departure from those books? What's familiar, what's new? 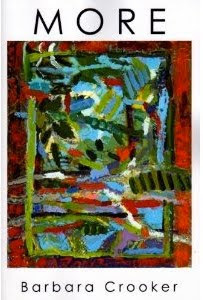 Barbara: Radiance, my first book, was organized like a quilt patch, with each section containing poems on the main themes: a child with autism, an aging parent’s decline, the search for spiritual meaning in a secular age, love in a long-term relationship, ekphrasis (poems on paintings); all of these touching on some aspect of light. After an introductory section, the others line up in seasonal order, going from black and white winter to the radiance of autumn. In Line Dance, my second book, I had the themes (line, breath, dance and song), then found the cover art and tried to have the poems’ arrangement tie into the art—it’s a line of nests. 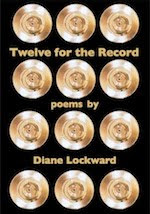 I wove the four themes, the way birds make their nests, while at the same time, I connected the poems within the sections echoing the conga line in the title poem. So More is more of a departure (pardon the pun), in that this time I’m using a block construction, with all the poems on the same subjects (art, my mother’s illness, family poems) grouped in the same section, each one dealing with a different definition or aspect or function of the word “more”: the hunger for more, (“Everybody’s got a hungry heart,” Springsteen); the desire for more love (“There is no remedy but to love more,” Thoreau); the need for more beauty, via art and culture (“It is the artist’s duty to create a world that is more beautiful,” Van Gogh); the reach for more of everything (“All I ever wanted was more,” anonymous). Because it took so long for me to get a first book out—15 years of constant contest entering and submitting—I became a student of how books are put together. I can see a case for both types of construction (the woven or tossed salad approach and the block method); as a reader, either way works for me. I’m also, as a reader, very impressed with writers who are able to start with an idea, then organically construct their books, writing poem after poem as they go. I don’t seem to be able to work that way, alas. So my method of construction is more like a person doing a giant jigsaw puzzle, with poems spread out all over, only it’s a puzzle where you don’t know what the final shape is supposed to look like. You just have to trust your intuition, and keep dancing in the dark. Many of the same themes and subjects thread through all three books. I think we’re all given a limited number of things we can write about; the trick is to try to do it better, or, at least, differently, each time. I hope that these poems are deeper, richer, fuller, than the ones on the same subjects in the previous books. I’m trying to work in layers, to add more complexity. And I also hope that it’s clear that poems are about more than their subjects, that these are merely Richard Hugo’s “triggering towns.” I’m trying to catch, with flat, two-dimensional paper and pen (or computer), three-dimensional multi-faceted fluid and ever-changing light and life. . .
Barbara: One of the delights of my life has been going to The Virginia Center for the Creative Arts every eighteen months, and getting to meet other writers, musicians, and visual artists, while I’m there. When the painter Marilyn Banner, who I’ve known for twenty years or so, started working with encaustics, I was smitten, and chose this painting after much indecision. I narrowed it down to six, and kept going back and forth between them, not an easy task on dial-up. This one, in the end, spoke to me because it not only gives the sense of exuberance and expansiveness that I hope the poems convey, but also because I saw echoes of Matisse in the brush strokes and use of black, of Dufy in the color choices, plus the freedom of Monet, the boldness of Kahlo—poems about all of these artists are in section 3. One thing you can’t see in the cover is the texture. My response to encaustic work is visceral and tactile; I just want to lick them. 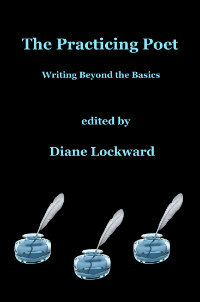 Diane: Why did you title the book More? Barbara: When I stepped back and looked at the work, it seemed that this was what most of the poems in the manuscript had in common. Years ago, the late poet Ann Silsbee said in an e-mail, “When I think about your work, 'plenitude' is the word that always comes to mind,” and although that word wasn’t quite right as the book’s title, the concept was there, in the back of my head. Barbara: Czeslaw Milosz has said, “Poetry is the passionate pursuit of the real,” and my hope is that readers will feel they’ve encountered something real between the covers. I also hope that readers will see that I take as my motto these words of Wendell Berry, “Be joyful, even though you’ve considered all the facts.” I hope that my work is accessible, even though I know it’s a two-edged sword. But most of all, I hope I’ll have readers, people who actually want to hold a book in their hands, and who will read a book of poetry not just once, but many times. I may be describing an endangered species, as recently, books on Kindle surpassed the number of physical books sold on Amazon. But I hope not! Barbara: I chose “Ode to Chocolate” because it’s something I love, something I like to give as gifts. Instead of a book launch party, I’m bringing chocolate to every reading I do this year (dark, of course! ), and handing out squares to the audience. This time it will have to be virtual chocolate, but I hope that the readers of your blog will enjoy every bite! Now let's all gather round and listen to Barbara read her poem for us. Party Time! Barbara invites us all to join her in some refreshments. Barbara: Pull up a wrought iron chair, and come sit with me under the plane trees by a fountain. Yes, we're in a small village somewhere in France. Here comes the waiter with our order: café noir (rich dark coffee) and pain chocolat, the world's greatest culinary invention, a flaky buttery croissant with a layer of chocolate inside. Coffee in France comes with its own square of dark chocolate, bitter and sweet at the same time. How civilized! Spread out your linen napkin, and let's dig in. Best of all, since this is a virtual party, there are no calories! Don't leave the party without picking up a copy of Barbara's new book. Verbal chocolate! Delicious. While you enjoy the snacks and the poetry, please leave some comments for Barbara in the Comment section. Thanks for coming to the salon. I love Barbara Crooker's poems, and that chocolate one is one of my favorites. She's been featured on "The Writer's Alamanac" a number of times. As someone who also worships that Dark Master, I absolutely loved the chocolate poem. Thanks for pointing it out. In fact, I think I will print it out to share at a reading I'm hosting tonight. the chocolate poem is a favorite. I can't really add anything, as the poems speak for themselves, thoughtful, joyful, humorous, etc. All Barbara's books speak of our common humanity. I want to be MORE after reading her poems. I didn't expect to feel like I'd actually heard/seen Barbara and eating a chocolate croissant, but in fact it's as if I did. And without having to board a plane to PA. Thanks for hosting Barbara's party, Diane. What a fun way to pass the time during a flight delay! Hugs to both of you. There too many fine poems in Barbara's new book to pick a favorite, but "Ode to Chocolate" is certainly one of mine. Thank you, Diane, for inviting Barbara to your poetry salon. I could taste the bittersweet-ness and feel the smoothness of chocolate as I read and listened to you read the poem. Loved it, as I do most of your work...and I want to go to France and drink espresso and eat pain au chocolat!